Using Infographics have become an effective way of distributing content on the internet. This is especially true as we tend to process images more easily than just reading paragraphs of text. Infographics contain information delivered using visual cues, which means that many of your followers will find it useful to actively share with their friends and followers. A “win-win” situation right! 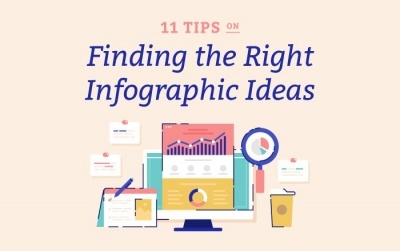 We take a look at 11 tips on finding the right topic for your Infographic thanks to Milkwhale. Knowing your audience is the fundamental aspect of how your infographic will fare on the internet once it’s published. Make sure that your topics are relevant and valuable to your target audience. Marking the bullseye for your infographic before creating it can help you come up with a narrower scope of topics. That way, your time won’t be wasted messing about with topics that will not help you achieve that goal. Whenever you think of a topic for your infographic, ask yourself this: “What would I do with this information?”. If you can’t answer that question yourself, then that topic is no good. Coming up with topics is a creative process, however keyword research is definitely not. You need to make sure that the topics that you choose for your infographic can rank well in the search engines. Use tools like Ahrefs, Google Keyword Planner, Majestic, or MOZ to find out which keywords return monthly searches. Looking up for references doesn’t necessarily mean you create an infographic around the same topic. It also means that you get to avoid mistakes in infographics that get downvoted (or disliked) to oblivion, and learn what the top infographics have that makes people like them. In content marketing, you shouldn’t rely on being "Old-School-Cool". Using Google Trends and other tools that can help you keep up with current trend in the industry is really useful when it comes to collecting and formulating ideas. Do you have an old article that’s just lying around and NOT getting any traction? If you think that article is good, but just poorly performing in terms of SEO, you should repurpose that into an infographic. Infographics have a bigger chance to get shared because they contain bite-sized information that can be easily digested by online readers. Images too, are more reliable when viewed on different platforms than websites and blog posts. Once you have a solid topic that can rank for a reasonably competitive keyword, and nobody else has made an infographic about it, make sure that you can find enough resources and references to create an infographic out of it. If you’re dedicated enough to be the first researcher on the topic, that’s good for you. However, keep in mind that being the first in researching and experimenting on a topic requires time and resources. In accordance to tips #9, if you are not sure that there are enough materials to be used as reference for your topic – be flexible and find a different angle for your topic. If that’s also not possible, it’s best for you to find another topic. If you have a deadline to publish a new infographic, make sure to research the topic at least a month before that. Awesome ideas don’t come every day. Sometimes it just needs time to "cook itself" in your brain. So if you don’t get a brilliant idea the first time, don’t beat yourself up. Andre Oentoro is one of the co-founders of Milkwhale, a creative agency specializing in infographics. He’s also the author of Viral Infographics, a guide to getting the most value out of your website’s traffic.